Home › Blogs › Admin's blog › Election of the first Australian as the President of the International Play Association. Robyn's has 25 years experience working with children and families across Education, the community sector, and local government. With qualifications in education, children’s services, community management, and training and workplace assessment she is a frequent guest speaker at conferences and seminars across Australia and internationally as well as a spokesperson on children's issues in the National media. As Editor of the quarterly newspaper “Network News” her advocacy work extends to the written word and she is a regular contributor to newsletters and websites on the topic of middle childhood, children’s services, leadership, and the importance of play. A member of the International Play Association since attending her first IPA conference in Melbourne in 1993, Robyn was formally co-opted to the position of Vice President of the International Play Association in 2012. Prior to this time Robyn had served in the role of Regional Vice President. In 2012 Robyn was part of the international delegation to the United Nations in Geneva to progress the development of the UN General Comment on Article 31 “The child’s right to play”. In 2013, Robyn facilitated an International World Café on Article 31 at the official launch in Geneva of the General Comment. Most recently in 2016 she was in Geneva for the International Day of Discussion on children and the natural environment and worked on the IPA project “Under the same sky”. Robyn’s work has been recognised at a number of levels with the presentation of a South Sydney Council Community Achievement Award, a NSW Children’s Week Award for services to children and the awarding of a Commonwealth Government Centenary Medal for services to Australian Children’s Services. She is a Fellow of the Australian Institute of Community Practice and Governance and the Australian College of Educators. 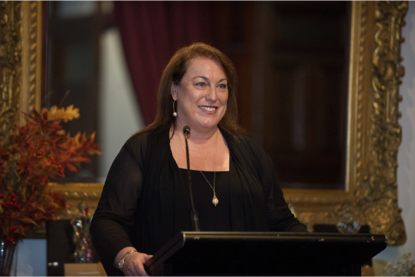 In 2012 Robyn was awarded The Allan Laughlin Perpetual Award for excellence in leadership from the Australian College of Educators. This was followed by the awarding an “Outstanding Educator” award from the Australian College of Educators in 2014. An Alumni of the NSW Benevolent Society's "Sydney Leadership" program Robyn remains passionately committed to social inclusion and the development of communities that nurture and support children and offer opportunities for them to engage with their local community.